The level of interleave distortion or just sampling distortion in general to expect from an oscilloscope measurement is often not clear from examining an oscilloscope's data sheet. In this post we will look at how to measure and evaluate an oscilloscope's sampling distortion. This post builds on the information from last week's post entitled Interleaved Sampling in Oscilloscopes. Without knowing a scope's level of sampling distortion there is no way to know how accurate a representation of a measured signal the scope is providing. A scope with a high sampling rate may not deliver the best representation of a measured signal compared to a scope with a lower sampling rate. This depends on such factors as the measured signal's bandwidth and if the scope uses an interleaved sampling scheme and how well it was implemented in the design. The closest specification that some scope vendors provide to quantify sampling fidelity is effective number of bits (ENOB). But ENOB is a composite specification consisting of several error components including input amplifier harmonic distortion and random noise. Although an effective number of bits test can provide a good benchmark comparison of overall accuracy between scopes, effective bits is not a very well understood concept, and it requires exporting digitized data to a PC for number crunching. Basically, an effective number of bits test first extracts a theoretical best-fit sinusoidal signal from the digitized sine wave. This sine wave curve-fit algorithm will eliminate any errors induced by oscilloscope amplifier gain and offset inaccuracies. The test then computes the RMS error of the digitized sine wave relative to the ideal/extracted sine wave over one period. This RMS error is then compared to the theoretical RMS error that an ideal ADC of “N” bits would produce. For example, if a scope’s acquisition system has 5.3 effective bits of accuracy, then it generates the same amount of RMS error that a perfect 5.3-bit ADC system would generate. For more detail on ENOB click here. A more intuitive and easier test to conduct to see if a scope produces ADC interleave distortion is to simply input a sine wave from a high-quality signal generator with a frequency that approaches the bandwidth of the scope. Then just make a visual judgment about the purity of the shape of the digitized and filtered waveform. Let's look at an example comparison using the visual sine wave test. The below figures show two screen captures from two different scopes of a high quality 200 MHz sine wave. The top screen capture is from 1-GHz bandwidth scope sampling at 4 GSa/s. This scope has a sample-rate-to-bandwidth ratio of 4:1 using non-interleaved ADC technology. The bottom screen capture is from the 1-GHz bandwidth scope sampling at 10 GSa/s. This scope has a maximum sample-rate-to-bandwidth ratio of 10:1 using interleaved technology. Although we would intuitively believe that a higher-sample-rate scope of the same bandwidth should produce more accurate measurement results, we can see in this measurement comparison that the lower sample rate scope actually produces a much more accurate representation of the 200 MHz input sine wave. This is not because lower sample rates are better, but because poorly aligned interleaved real-time ADCs negate the benefit of higher sample rates. The visual sine wave test doesn't really prove where the distortion is coming from. It merely shows the effect of various error/components of distortion. However, a spectrum/FFT analysis will positively identify components of distortion including harmonic distortion, random noise, and interleaved sampling distortion. Using a sine wave generated from a high-quality signal generator, there should be only one frequency component in the input signal. Any frequency components other than the fundamental frequency detected in an FFT analysis on the digitized waveform are oscilloscope induced distortion components. The figure below shows an FFT analysis of a single-shot capture of a 2.5 GHz sine wave using an oscilloscope sampling at 40 GSa/s. The worst-case distortion spur measures approximately 90 dB below the fundamental. This component of distortion is actually second harmonic distortion, most likely produced by the signal generator. And its level is extremely insignificant and is even lower than the scope’s in-band noise floor. The figure below shows an FFT analysis of a single-shot capture of the same 2.5-GHz sine wave using a different scope with the same sample rate (40 GSa/s). The worst-case distortion spur in this FFT analysis measures approximately 32 dB below the fundamental. This is a significant level of distortion that would most likely be visually apparent in the time domain. The frequency of this distortion occurs at 7.5 GHz. This is exactly 10 GHz below the input signal frequency (2.5 GHz), but folded back into the positive domain. The next highest component of distortion occurs at 12.5 GHz. This is exactly 10 GHz above the input signal frequency (2.5 GHz). Both of these components of distortion are directly related to the 40-GSa/s sampling clock and its interleaved clock rates (10 GHz). These components of distortion are not caused by random or harmonic distortion. They are caused by real-time interleaved ADC distortion. In this post we looked at three methods for measuring or evaluating interleaved sampling distortion and general sampling distortion. The three methods included ENOB, visual test, and spectrum analysis. This type of test is necessary when you need to evaluate a low noise signal, such as a digital clock, and you want to ensure that you are actually seeing the measured signal noise and not the noise of the measuring device. If you have any personal insights to add to this post please use the comments section below and if you have any questions feel free to email me. In this post we will look at interleaved real-time sampling in oscilloscopes and how interleaved sampling errors can result in a distorted representation of a signal. After reading this post you will understand why choosing an oscilloscope based solely on sampling rate does not always give you the best representation of the signal you are measuring. 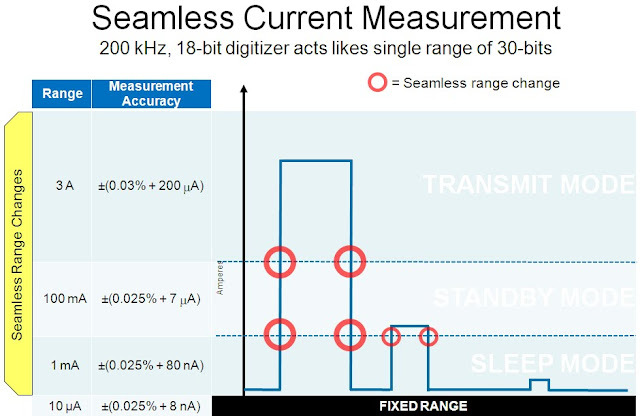 As digital signals continue to increase in speed, oscilloscope vendors are under constant pressure to increase the sampling rate and bandwidth of their products so that engineers have a means to measure the digital signals in their design. The most intuitive way to increase the sample rate of a scope is to simply use a higher sampling rate ADC in the scope, but this technique is not always cost effective or practical. To solve this design challenge a common technique adopted by all major scope vendors is to interleave multiple real-time ADCs. The below figure shows a block diagram of a real-time interleaved ADC system consisting of two ADCs with phase delayed sampling. In this example, ADC 2 always samples ½ clock period after ADC 1 samples. After each real-time acquisition cycle is complete, the scope’s CPU or waveform processing ASIC retrieves the data stored in each ADC acquisition memory and then interleaves the samples to produce the real-time digitized waveform with twice the sample density (2X sample rate). Scopes with real-time interleaved sampling must adhere to two requirements. For accurate distortion-free interleaving, each ADC’s vertical gain, offset and frequency response must be closely matched. Secondly, the phase-delayed clocks must be aligned with high precision to ensure equally spaced samples. That means ADC 2 must be delayed precisely 180 degrees after the clock that samples ADC 1. Remember equally spaced sampling is part of the Nyquist sampling theorem for accurately recreating a signal. in order to satisfy Nyquist’s rule 2 that dictates equally spaced samples. For the rest of the post we will focus on sampling spacing errors due to poor phase delayed clocking. The timing diagram shown in the below figure illustrates incorrect timing of interleaved samples if the phase-delayed clock system of two interleaved ADCs is not exactly ½ sample period delayed relative to each other. This diagram shows where real-time digitized points (red dots) are actually converted relative to the input signal. But due to the poor alignment of phase-delayed clocking (purple waveforms), these digitized points are not evenly spaced, thus a violation of Nyquist’s sampling theorem. When the scope’s waveform processing engine retrieves the stored data from each ADC’s acquisition memory, it assumes that samples from each memory device are equally spaced. In an attempt to reconstruct the shape on the original input signal, the scope’s Sin(x)/x reconstruction filter produces a severely distorted representation of the signal, as shown in the figure below. Since the phase relationship between the input signal and the scope’s sample clock is random, real-time sampling distortion, which is sometimes referred to as “sampling noise,” may be interpreted mistakenly as random noise when you are viewing repetitive acquisitions. But it is not random at all. It is deterministic and directly related to harmonics of the scope’s sample clock. that directly quantifies the quality of their scope’s digitizing process. This means if you just grab the scope in your lab with the highest sample rate assuming that it will deliver the best representation of your signal you may be wrong. For instance lets say you want to capture a 1 GHz digital clock signal. If you have a 6 GS/s scope and a 10 GS/s scope to choose from it makes sense to assume the latter will deliver the best representation of signal. But if the 6 GS/s scope has a single ADC and the 10 GS/s scope uses an interleaved ADC scheme, then the former may deliver a better representation of the signal, but there may not be a clear way to know this by comparing the scope's data sheets. In next week's post we will look at methods to test and evaluate a scope's sampling distortion. If you have any personal insights to add to this post please use the comments section below and if you have any questions feel free to email me.